One of the freshest fish oils available, our proprietary bio-available blend contains high levels of DHA to supercharge your health in easy-to-swallow mini gels. Omega 3/DHA Fish Oil Mini Gels contains our exclusive formula with 350mg of DHA per serve (2 mini gels) or 700mg of DHA for adults (4 mini gels), making it a convenient way to ensure you or your child get adequate levels of Omega 3 essential fatty acids daily. Our unique blend of natural New Zealand Hoki and concentrated tuna oil provides the benefits of both a full spectrum fish oil and a high level of Omega 3. Its freshness is verified by third-party laboratories, but you’ll also know it by the absence of any “fishy” aftertaste. Because of their small size, Omega 3/DHA Fish Oil Mini Gels is the ideal fish oil to ensure your child gets the right amount of DHA daily. Docosahexaenoic acid (DHA) is the most abundant fatty acid in the human brain, making up about 15 to 20 percent of the brain’s frontal cortex.1 It is also a key building block required for healthy brain growth and development. Formulated with 550mg of Omega 3 fatty acids per serve in the children’s dosage, or 1100mg of Omega 3 for adults, Omega 3/DHA Fish Oil Mini Gels is the single best foundation supplement for you or your child’s immunity and brain function. Some people want to take fish oil soft gels but just can’t manage to swallow them. The adult dosage of Omega 3/DHA Fish Oil Mini Gels provide the same amount of Omega 3s as our standard fish oil capsules, but are half the size, making them the ideal capsule for those who have difficulty swallowing. Children can take two mini gels daily, while the dosage for teenagers and adults is double, at four mini gels daily. This dosage ensures you and your family are getting the right amount of Omega 3 fatty acids, and most importantly, DHA in your diet. Xtend-Life Fish Oil has a wide array of benefits including inflammation management. Our proprietary bio-available blend contains high levels of DHA to supercharge your health and deliver the health results you desire. Why Fish Oil Not Plant Oil? Plant oils (including nuts, grains and seeds) do not contain DHA or EPA. Instead, they contain ALA which has an extremely low conversion to DHA in the human body (<10% dietary ALA conversion).12 On the other hand, dietary DHA and EPA, primarily found in fish and seafood, is well absorbed and readily used by the body. Xtend-Life products are effective, safe and exceptionally pure. We test each batch for purity, identity, and strength, and we produce all products in our own world-class facility in New Zealand abiding by both HACCP and GMP codes for dietary supplements. When you purchase from Xtend-Life Natural Products our guarantee to you is you will only receive the best fish oil supplements available in the market today. If on medication or aspirin, please consult your doctor. 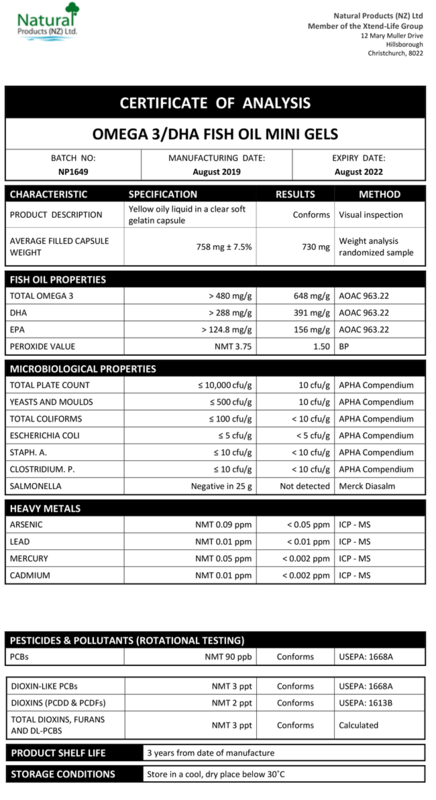 We have included below a copy of a typical Certificate of Analysis (CoA) for our Omega 3/DHA Fish Oil Mini Gels. You will note that there are two columns which are headed 'Specification' and 'Results' respectively. The specifications are simply our minimum standard to which each batch of Xtend-Life Omega 3/DHA Fish Oil Mini Gels has to conform, otherwise we would not release it. The results are the actual results from the independent laboratory that did the testing. Are Omega 3/DHA Fish Oil Mini Gels easy to swallow? Our Omega 3 Mini Gels are 50% smaller than the industry standard 1000mg soft gels, each serving of 2 mini gels contains 1000 mg of full potency fish oil, which provides 550 mg of omega-3 essential fatty acids, including DHA and EPA – easy to swallow for anyone who struggles with larger soft gels. If you still have some difficulty, you can always puncture the soft gels and squeeze the fish oil onto cold food. This method will not compromise the product's efficacy, provided the food is consumed right away to avoid oxidization of the oil. We advise not adding the fish oil to hot food, as this may damage some of the valuable properties. What is the dose of Omega 3/DHA Fish Oil Mini Gels? The mini gels contain the very same high-quality fish oil blend as the standard Omega 3/DHA Fish Oil, simply in a smaller size. It may be taken by children as young as two years old at a dose of one soft gel per day, however, at this age, it is best to pierce the capsule and give the oil to the child on a spoon or mix into food. For children aged at 6 or over, the recommended dosage is one serving (2 soft gels) per day. For teenagers and adults, it is recommended to take 2 servings (4 soft gels) per day, which is equivalent to 1 serving of standard Omega 3/DHA Fish Oil. What are the main benefits of Omega 3/DHA Fish Oil? Omega 3 Fish Oil has a wide array of benefits for all the body systems and has powerful inflammation management properties. Our proprietary bio-available blend contains high levels of DHA to supercharge your health and deliver the health results you desire. Lift your mood - and stay mentally focused! Purity is one of our biggest strengths. We pride ourselves on having some of the most stringent fish oil specifications in the world and we back this up with hard data from independent internationally certified laboratories. Finished products are routinely tested for microbial and total heavy metal levels, as well as many in-process checks, to ensure a consistently high-quality product. Where are the Hoki and Tuna Fish Oil from? The Hoki Fish Oil is sourced from the pristine waters of the Southern Ocean off the coast of New Zealand. The molecular distilled ethyl ester Tuna Fish Oil is sourced from the clear waters of the Southern Indian Ocean. Why use tuna oil rather than smaller fish like sardines or anchovies, which have less bioaccumulation of toxins? The benefit of tuna oil is that it is naturally rich in DHA. Smaller fish may tend to have less accumulation of toxins, but this is not an issue with Xtend-Life fish oil because of the careful way the Tuna is processed. The Tuna oil is produced using molecular distillation and enzymatic hydrolysis. This results in exceptionally pure oil in natural Triglyceride form. This is why Xtend-Life fish oil has much lower levels of contaminants than other fish oil products on the market. What is the extraction process of the tuna Fish Oil? Our Tuna oil is supplied by one of the world's best fish oil manufacturers. This manufacturer uses very modern equipment and production methods to produce the concentrated Tuna oil. This means that the oil is only exposed to modest heat for a brief period during the concentration and purification of the oil. We chose this manufacturer because they are one of only a very small number in the world who has the ability to produce this high-quality oil while avoiding the need to use significant heat or convert the oil to Ethyl Esters during production. Will the Omega 3/DHA Fish Oil help children with ADHD, learning difficulties or that have trouble focusing? Xtend-Life Fish Oil has a high level of DHA (around 30%), which is the most complex of all omega 3 essential fatty acids and it is readily absorbed by the brain before any other Essential Fatty Acids (EFAs). Increasing the DHA content in the red blood cells of the brain has been shown to lessen hyperactivity or behavior problems and encourage better concentration and focus. Unfortunately, children these days often don't get enough DHA in their diet, therefore supplementing with a product high in DHA may offer great benefits to your children. Will Omega 3/DHA Fish Oil help improve eczema? Omega 3 fatty acids are highly recommended for skin conditions such as eczema. The fatty acid profile is nourishing and hydrating to dry, irritated skin. Fish oil also has inflammation management properties that may help to calm eczema. Omega 3/DHA Fish Oil Mini Gels is ideal for children as they are small and easy to swallow. Omega 3 is also highly recommended during pregnancy to help reduce the likelihood of conditions related to childhood allergies, which may include eczema.